The first week of the new year has been one filled with owls. Beau Mihalka, a volunteer firefighter from Argonne,WI, was driving on New Year's Eve. 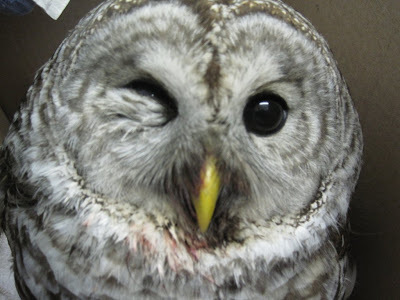 He witnessed a Barred Owl hit by a car. The car didn't stop, but Beau did. There was a major snowstorm happening at the time, so he kept the bird safe in a quiet place. ( cardboard box is always the best) He brought the owl to REGI the following morning. We took photos of Beau and the Barred Owl he rescued when admitted. Unfortunately my camera card had a malfunction. The images were lost. 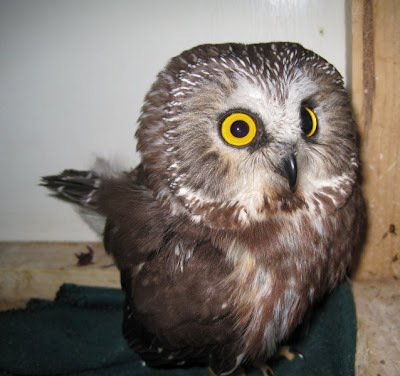 The photo above was taken on Sunday, two days after the owl was admitted. Many thanks to Beau for taking the time during a snowstorm and on a holiday night to care for this beautiful owl. Sometimes things we least expect can pose a danger to wildlife. 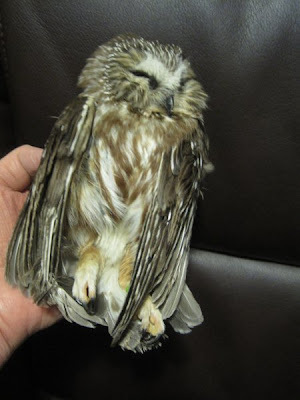 Who would think that an owl could become so entangled in nylon/ plastic string that it would be life threatening? 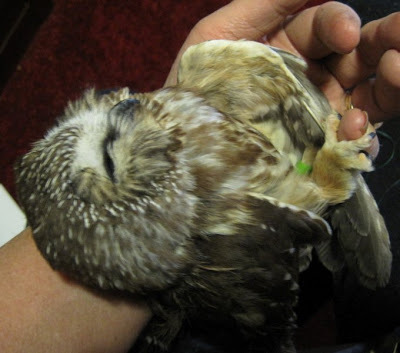 That is, however, exactly what happened to the Saw-whet Owl in these photos. She is doing well, better than we ever imagined. She has a dilated pupil in her left eye. It is hard to know if that was present before she was entangled, or if it was the result of oxygen loss when she had the string around her neck. Today she is on a higher perch looking bright and cheery. She is eating well. It looks like she managed to squeak through an impossible situation. It is something we can all be aware of. 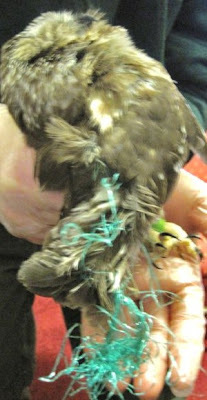 String, frayed tarps, or other line such as fishing line can be deadly to wild animals and birds. We usually find fishing mono- filament line wrapped around various parts of the anatomy of eagles, ospreys, and sea birds, including gulls and terns and pelicans. If you see string lying about, cut it in small bits and throw it away in protected bags. It is good to remember that birds can access it once it is in the dump as well. A Great-horned Owl was just brought in from the Wisconsin Rapids area. He has a broken wing and some internal injuries.